NAVARATNA PYRAMID costs 7000 rs. Instantly makes your place more than 90%+ in energy levels. It rectifies the Vastu defective places without Demolition / Re-Construction / Alteration. It increases the conversion rate of your efforts in to good happenings by increasing the energy levels. Wherever the positive energy of the house is low, the efforts are not converted into good happenings, because the energy present is not sufficient to push your efforts into good happenings. That is why we see many people, complaining that, their rewards are far less in comparison to the efforts they had put in. Typically , more efforts, less return situation. Whenever the positive energy is low in a business premises or shop , they don’t attract people. No good happenings will take place in a house, which is poor in energy. Similarly buildings/flats/apartments remain unsold, if they don’t enjoy good positive energies. Factories become sick, if they don’t enjoy good energies. All good happenings are represented by good energies and No good happenings will enter a house for number of years, if the house doesnot enjoy good energy. HERE IS AN INSTANT SOLUTION TO MAKE YOUR HOUSE ENJOY MORE THAN 90%+ POSITIVE ENERGY LEVELS INSTANTLY – NAVARATNA PYRAMIDS. Based on the practices adopted by our forefathers for centuries, ie., to spread NAVRATNA stones at the entrance of the house, so that the house enjoys all kinds of energies such as, Positive Energy, Prosperity Energy, Health Energy, Spiritual Energy etc., for 100s of years, we have created a Navaratna Pyramid packed with about 120 grams ( about 600 CARATS) of RAW NAVARATNA STONES, which are 10 times more powerful than the cut and polished ones. These Navaratna Pyramids when placed in a Vastu defective place, corrects the place instantly and makes the place enjoy more than 90%+ positive energy instantly. It emits more than 450 000 Bovis Units of Positive Energy when measured and possibly the most powerful Pyramid in the world ! NO DEMOLITION/RECONSTRUCTION/ALTERATION ETC., ARE REQUIRED, WHEN YOU KEEP A NAVARATNA PYRAMID IN THE VASTU DEFECTIVE PLACE. THE PLACE GETS CORRECTED INSTANTLY. In practice, we have seen, by keeping 1 Navaratna Pyramid at the inside entrance of the premises, makes the entrance energy levels above 90%+ instantly. 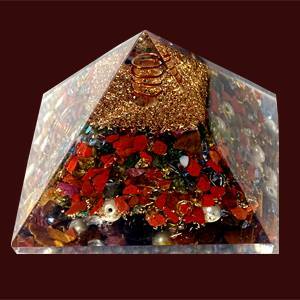 Wherever the house enjoys very very poor energies, it is better to keep 1 Navaratna Pyramid at the centre of the house, in addition to keeping one at the inside entrance. The house will become 90%+ energetic instantly. Each Pyramid covers about 1000 sq.ft of area, and makes it highly positive. When the Ground floor is energized, the First floor also enjoys the similar energy levels. 1000s of people have kept the Navaratna Pyramids in their homes, offices, Factories etc., and have been amply rewarded by better conversion of their efforts into good happenings. One should put in the right efforts with a positive frame of mind to reap the fruits of the better energy present in their place. These Pyramids are also impregnated with PROSPERITY FREQUENCY (CURRENCY NOTES) to take you to the Prosperity Mode, using our Proprietary Technology called ‘Frequency Embedding Technology’. Navaratna Pyramid can be used as a Powerful Wish Pyramid also, by keeping your Wish List below the Pyramid, with utmost faith and positivity.